In 2008, we opened the doors at our first location in Rialto California at 1214 W Merrill Ave, Rialto, CA and have never looked back! Prior to opening our doors in 2008 we worked in the sign industry for more than 10 years. Thanks to all of our wonderful customers this business has provided for our family since day one. Then in 2014 we decided to expand and open our second location in Hesperia California at 15800 Main Street, Suite #160, Hesperia, CA. Although it has been a struggle during its first year, the word is starting to get around and we are proud to say that it was vote “Best Trophy Shop” in Hesperia for 2015. And now we are expanding again by giving our customers a third location to shop at “The Internet”! So no matter where you go, either online or to one of our stores, know that you can count on us! 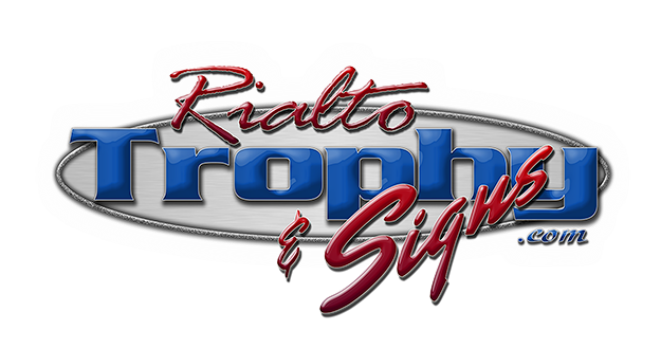 Rialto Trophy is a family owned and operated business. We take pride in our work and our customer service. When you place an order with us, you can count on it being ready on time! But please don’t think of us as just a Trophy Shop, we are also a Sign and print shop! We would like you to think of us as your one stop shop for all your Business or Personal needs. No job to big or small, we do them all. If you don’t see what you are looking for on our list, please give us a call. Chances are, we can get it done for you quickly and less expensive than most of our competitors. Be sure to check back on our website often because we are always adding new items.